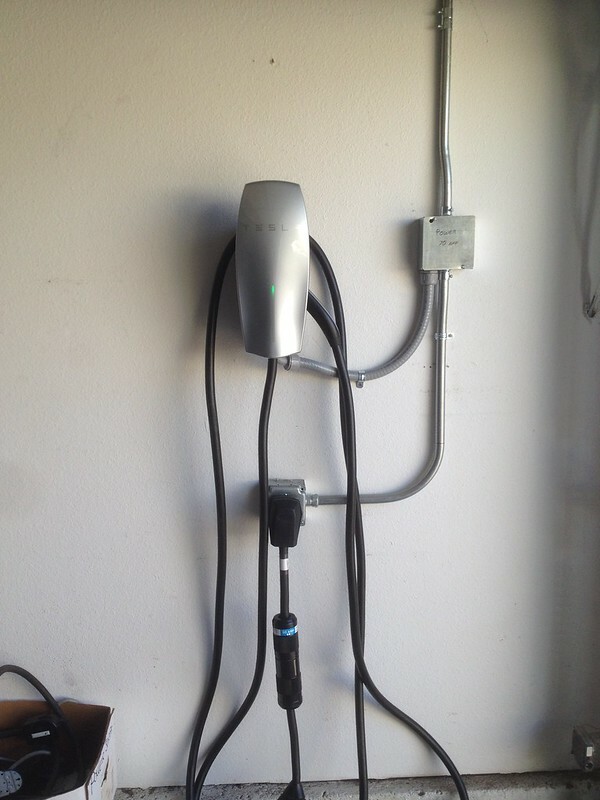 We had the opportunity to upgrade and make some changes to our home Electric Vehicle (EV) charging setup and thought to share that with you. I went back to look at my posts to see if I could update what I thought I had written about in the past. It turns out that I must have shared this information to the public via forum posts and not on the blog, so I figured to go over home charging today. As a long-time multi-EV owner, one of the things that we’ve setup at our home is the ability to charge our EVs at the same time. This can be as simple as running several 120V plugs, but when you drive the miles that we had on our daily commute, 120V service is just not enough. As a result, we’ve made accommodations to upgrade our EV charging to varying grades of 240V service. So, to explain what I mean by varying grades of 240V service, I need to go off on a short tangent, I’m not an electrician, but having been involved with EVs for over four years has made me understand some EV basics. 1) Battery capacity and EV range is measured in kWh of storage (your consumption rate determines what that range is in miles or kilometers.) This is why the Model S and Model X is sold with differing models corresponding with battery size. 2) The speed to re-fill this battery capacity is measured in several ways, but basically in kW of power. The higher the number, the faster that a car can charge. So, this kW maximum for a charger is the amount of Volts multiplied by the Amps of the service. Furthermore, an EV charges at 80% of the total Amperage that the circuit is rated for, so a 40A circuit can use a maximum of 32A to charge. On a basic, common North American plug outlet, 120 Volt x 15 Amp service, an EV driver can use 120V x 12A = 1.44 kW of power. 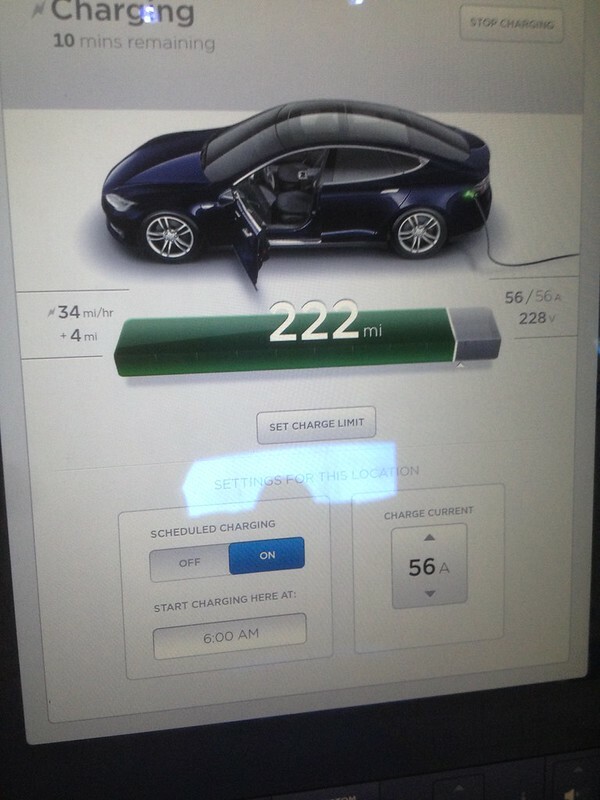 (On Model S, this is a maximum of 4 miles per hour charge rate, under ideal conditions.) It is interesting to note that many early EVs of this current generation (2011 and 2012 Nissan LEAF and Chevy Volts) had a 3.3 kW charger. Even though, I believe, previous generations of EVs (GM EV-1, RAV4 1st gen, etc.) had 6.6 kW charging. Many current EVs now provide at least a 6.6 kW charger. Our old ActiveE was rated at 7.2 kW (originally, but by the end this was de-rated closer to 5.5 kW by software because of some issues.) My wife’s Roadster has a 16.8 kW charger and our Model S is equipped with dual chargers for a total of 20 kW charging capability. I digress… Back to the point… The higher the amperage for the circuit installed, the thicker AND more expensive the wire will be. I am sure that for my North American EV readers, many have one EV plug to provide 240V service charge their car. How many places to charge 240V do you have at home? 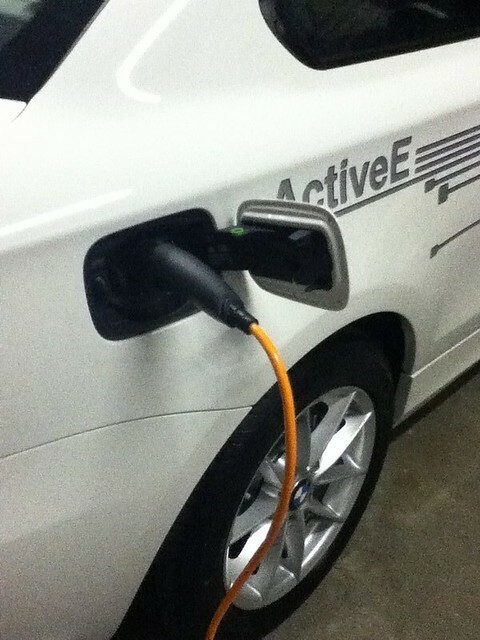 When we first took delivery of our BMW Active E in 2012, we didn’t have a single 240V service installed in our garage. There was a grant program available for new EV owners/lessors to take advantage of that covered the cost of the EVSE and some of the installation. 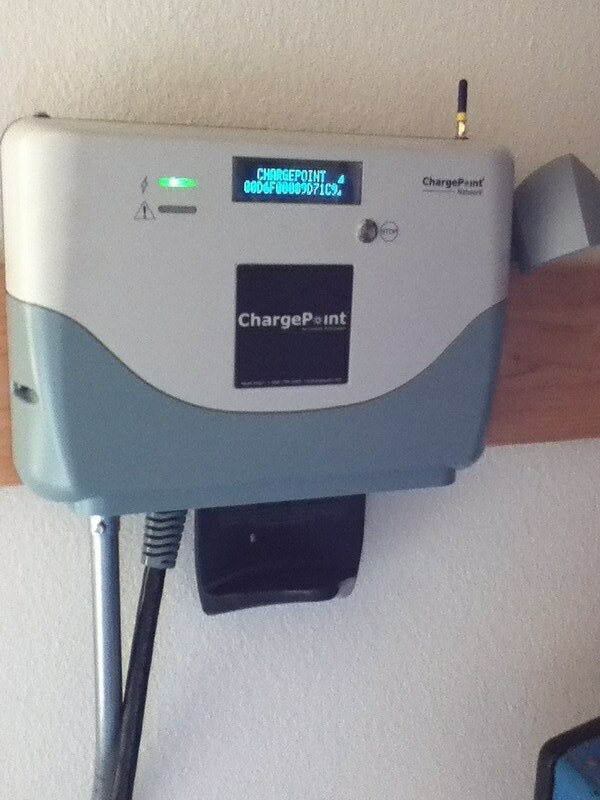 The Chargepoint CT-500 was an intelligent/networked EVSE that connected to the Internet over a mobile network (2G?!?) connection and part of the bargain was that the government and researchers can glean the information about the habits of the participants in the grant program. Here is the CT-500 when it was first installed. To install the units, we had to use Clean Fuel Connection and their sub-contractors for the work and it was a pretty painless program. After signing the contract they were at our house two days later with the EVSE and our days of charging Level 1 was put in the back burner. 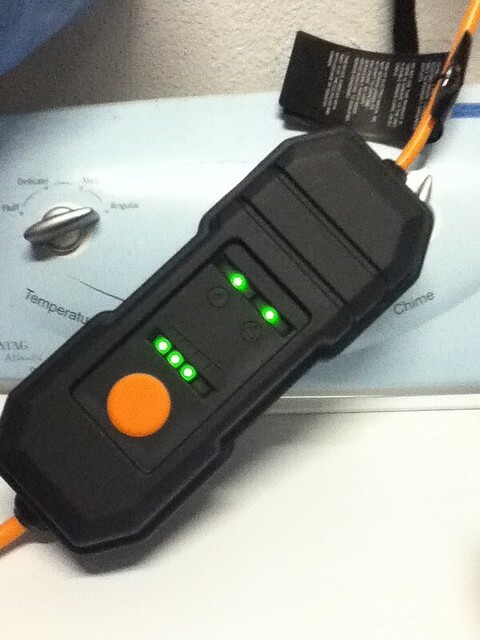 The charger was hardwired and the installers did a great job. 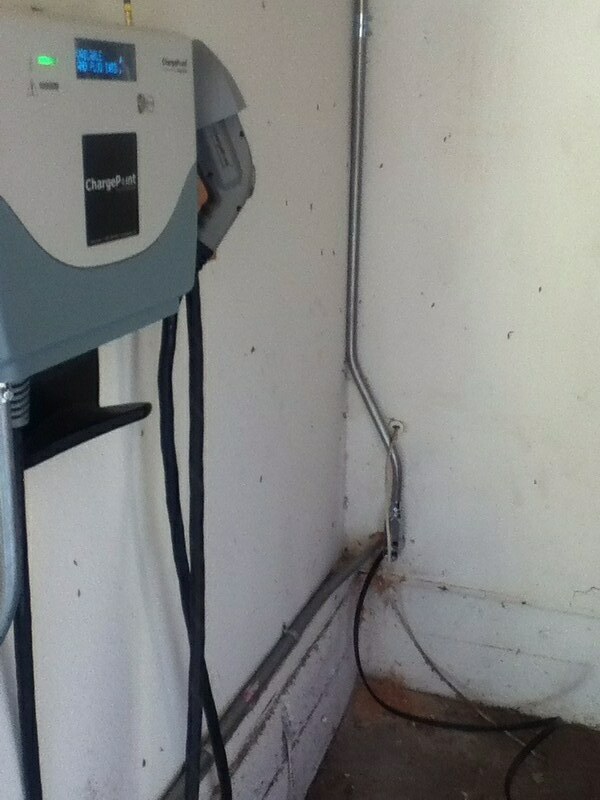 Here it is on the day we first installed the EVSE and we charged the Active E on that first Level 2 charger. With this Level 2 setup and public Level 2 charging we were able to drive the Active E 54,321 total miles during the two years of the lease. Several years later, the intelligent features of this charger became unsupported because the mobile network that the signals rode on was being decommissioned by AT&T. 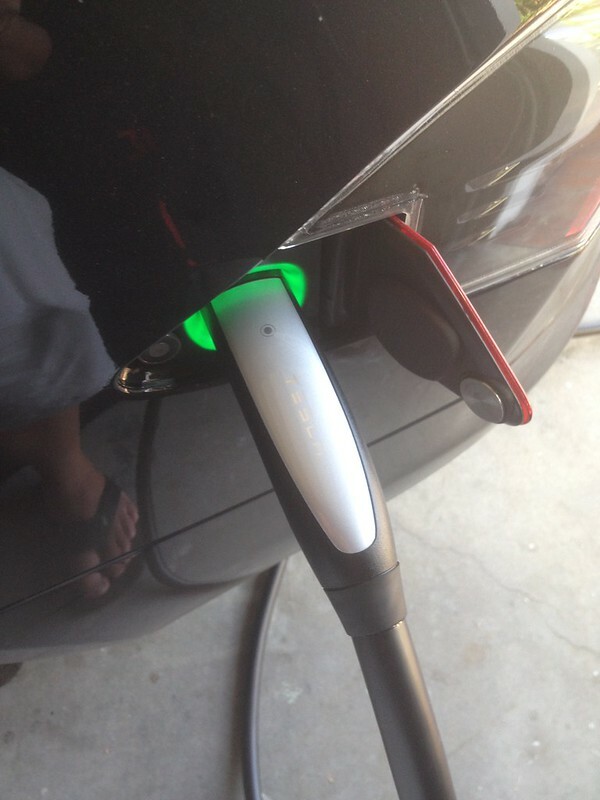 So, today, we’ve lost the “smart” functionality of the charger, but it still works great with the Model S. So, our first dedicated EV charger was installed in March 2012. A year and a half after we started driving the Active E, we purchased my wife’s Roadster and finalized the order for our Model S. Since we were already “experienced” rEVolutionaries. We had a good idea of what it takes to charge a car and how long it took to do so. 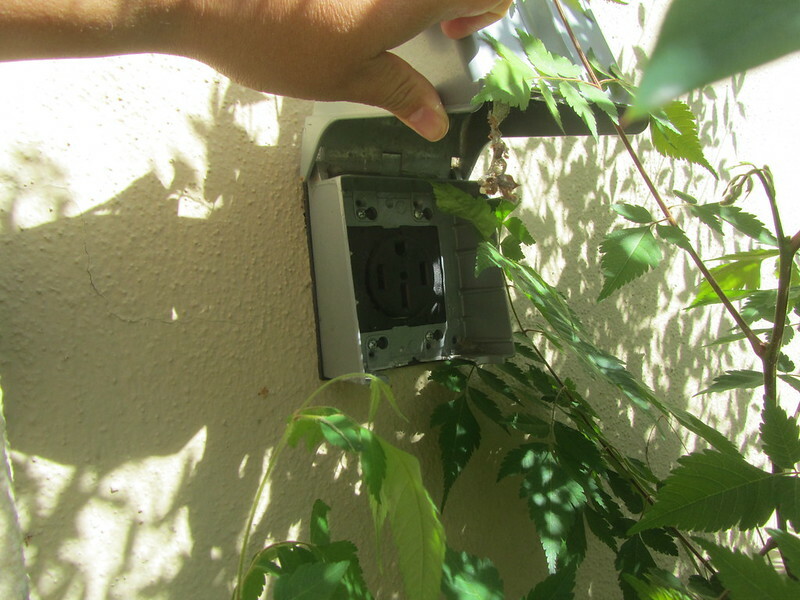 We decided to install several NEMA outlets in the house, two NEMA 14-50 outlets and one NEMA 6-50. 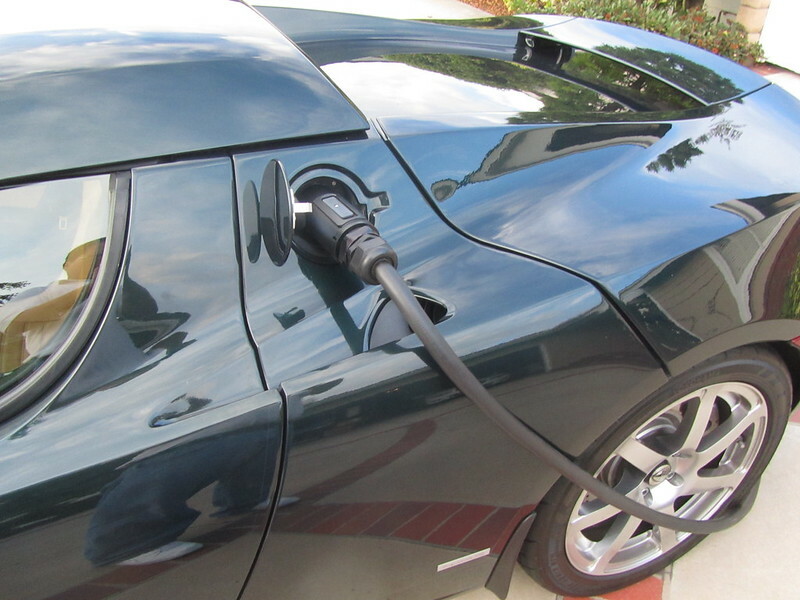 We picked the NEMA 6-50 because, in 2013, the first “plug” ready non-Tesla EVSEs were being produced and we wanted to be able to charge “anything” off that and didn’t feel the need to recover miles faster than a 50 Amp feed on either the Roadster that we took or the Model S that was soon to arrive in November 2013. The approximately 25 miles per hour that we anticipated to recover on a 50 Amp circuit (40 Amps usable) was going to be enough for our drive. 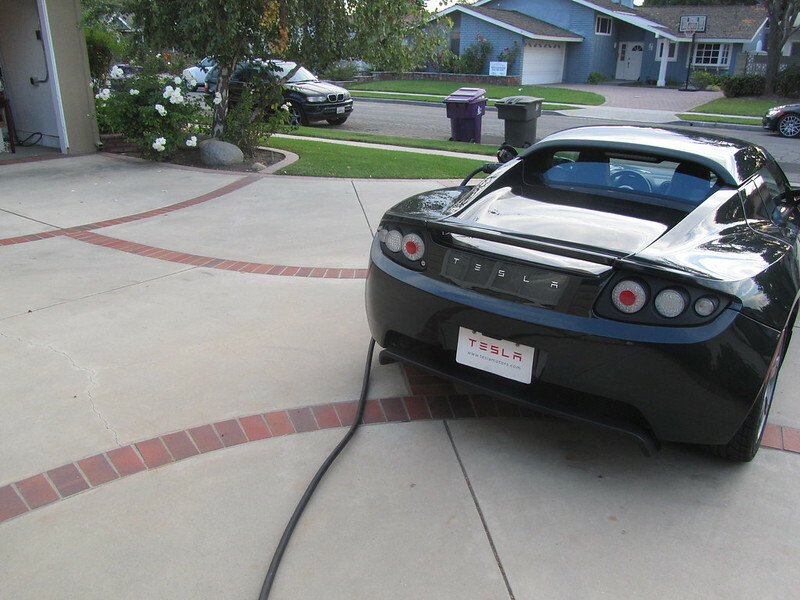 When we originally ordered our Roadster, we were unsure as to what sort of charging we would get with it that we ordered a Leviton 40A EVSE to deliver the wire speed of the NEMA 6-50 at full speed. Here is that Leviton being installed for the Roadster to use on its side of the garage. At the time of the purchase, this EVSE was selling for approximately $1200 elsewhere and Amazon sold the same model for $1050. In 2016, this same EVSE is now $699. The EVSE powered up. However, we ended up returning the Leviton EVSE as it was incompatible with the BMW Active E and made some WEIRD noises and sounded like it was having a BAD time, electrically speaking. Furthermore, it turned out that we were going to get a Roadster MC240 with my wife’s car, so that can take full use of the NEMA 6-50 that we installed for the Leviton EVSE. (We just needed an adapter to go from NEMA 14-50 to NEMA 6-50 that we had made for us.) 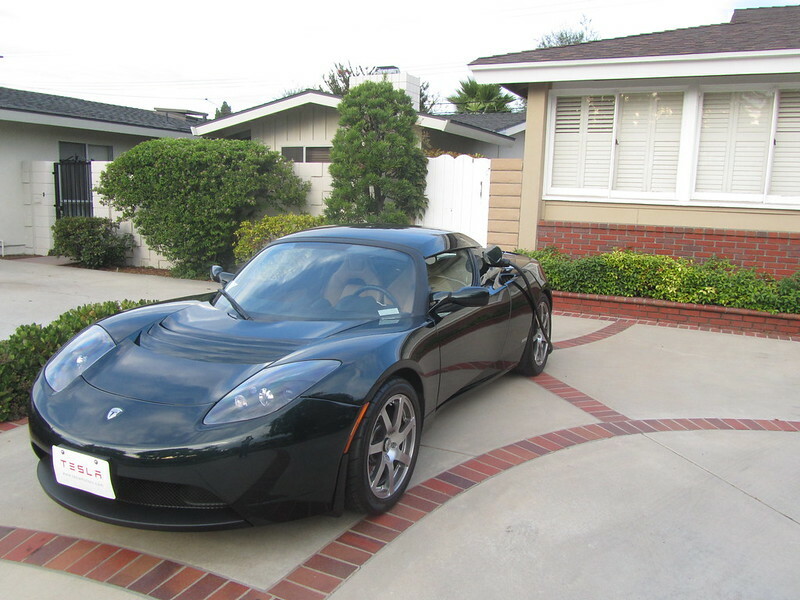 We charged the car on this MC240 for a short while (Tesla actually stepped down the charge from 40A to 30A on the MC240 on a 50A circuit) because we wanted a faster recharge time, so we found another Roadster owner selling their Roadster UMC and purchased that unit with a 6-50 Adapter to fit directly onto the circuit that our electrician installed for the Leviton. 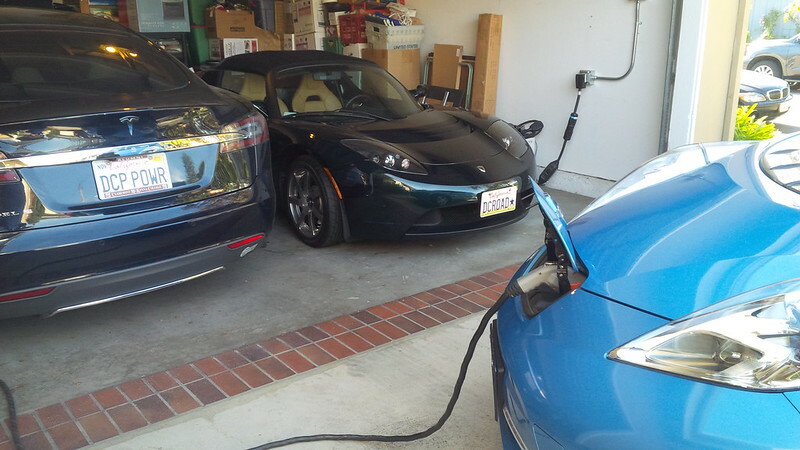 And used that equipment to continue to charge the Roadster until today. 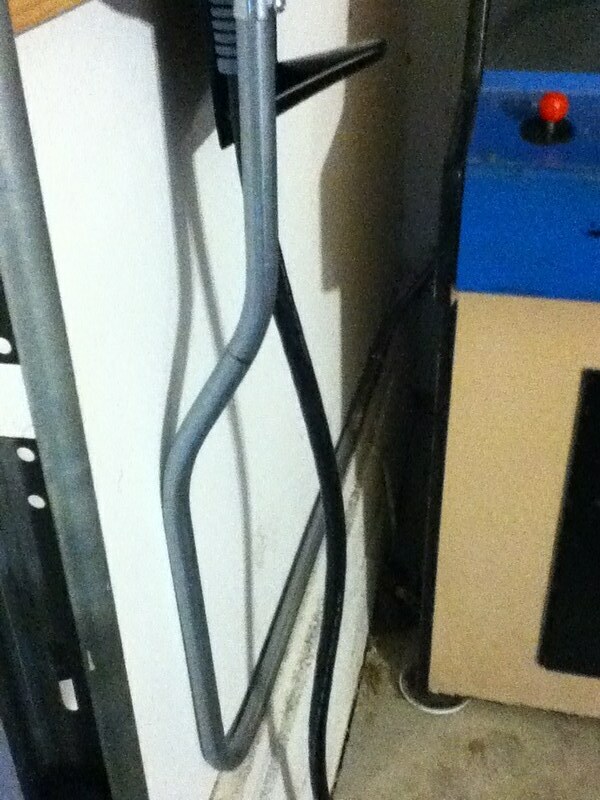 Here is a photo of the NEMA 14-50 outlet on the other side of the garage from the NEMA 6-50 installed for the Roadster. We wanted to makes sure to protect it from the elements. When we were having our electrician wire up the outlet for the Roadster, we wanted to future-proof that location and asked to have 70A service pulled in. To maximize the 70A breaker, we split that wire to two NEMA connectors the one (NEMA 6-50) in the garage for the Roadster and another one on the outside wall of the garage (a NEMA 14-50.) This sharing of the one breaker is not really the “code” for these connections. However, as long as we manually manage the Amperage on the line when using two different vehicles on each of the NEMA connectors, we should be fine. 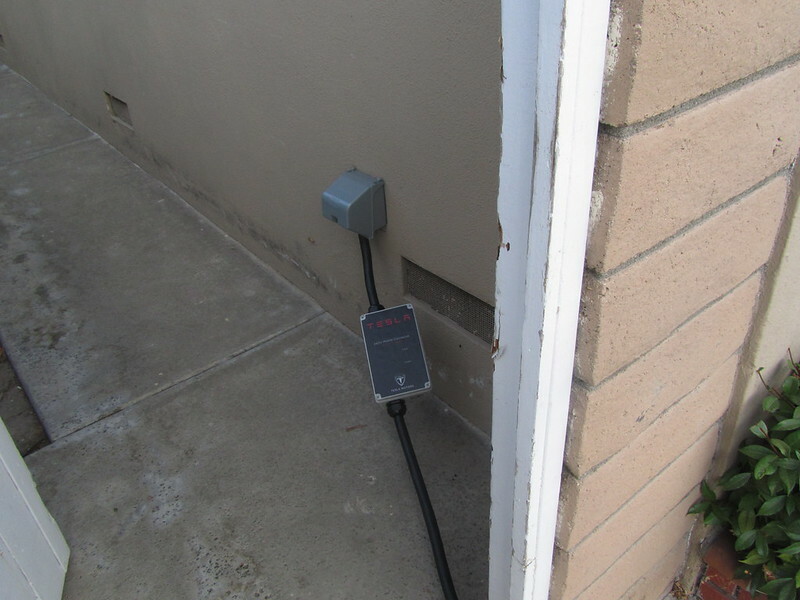 (Remember the 80% rule, so a 70 Amp breaker means that we don’t draw more than 56A continuously on the circuit.) One of the benefits of driving any Tesla is its ability to be managed “downward” on the amount of current to draw from a circuit. So, if a newer 6.6 kW Leaf were to be plugged into that receptacle and draw 32A, we still have 24A to use for the Roadster or the Model S.
As I mentioned earlier, we lucked out when we took delivery of our Roadster, we were provided with an original MC240 (which works only with the 1.5 Roadster) and we shortly thereafter got the Roadster UMC which is the pre-cursor for the Model S Mobile Connector (MC) and its replaceable terminals. 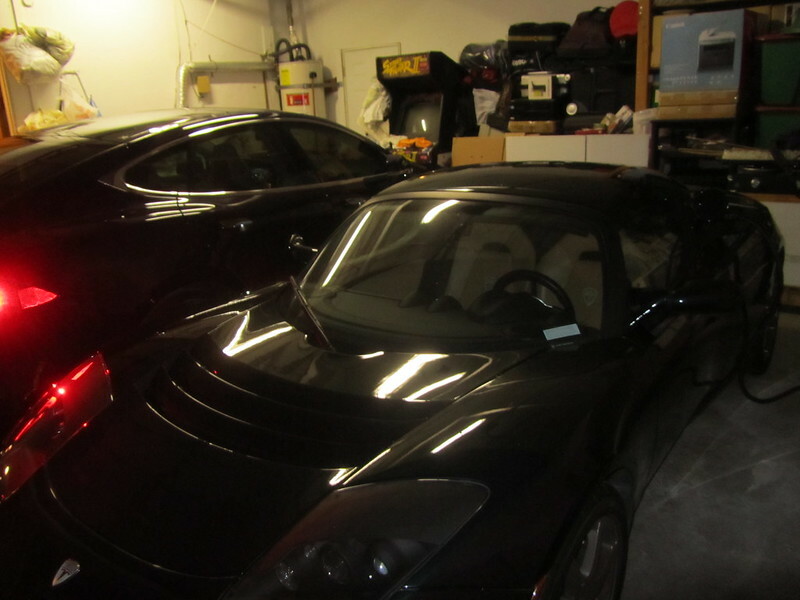 The Roadster one continues to be more flexible than the Model S MC in that it still has ten choices for different terminals for the product, we bought the NEMA 14-50 and NEMA 6-50 adapters to work with the plugs that we have in our garage. 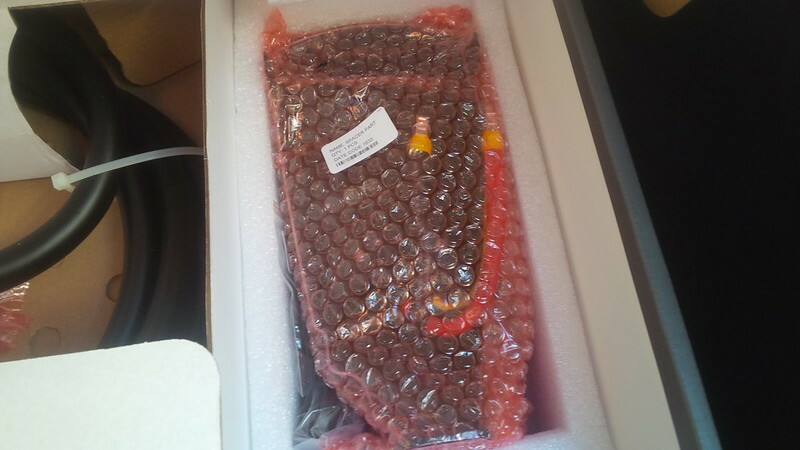 We also ordered Quick Charge Power’s Jesla, however this was before it was even a QCP product. Tony Williams worked with me to customize a Model S MC to be a Jesla. 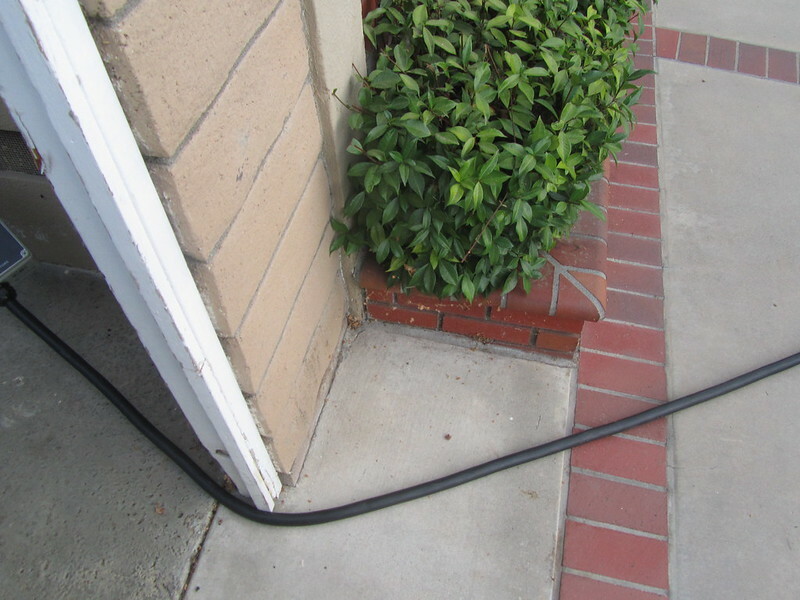 I wanted something that would work with ANY EV out there and the Jesla would plug into any of the other outlets in the garage and in the exterior of the house for when we have visitors, like my mom and her Nissan Leaf. 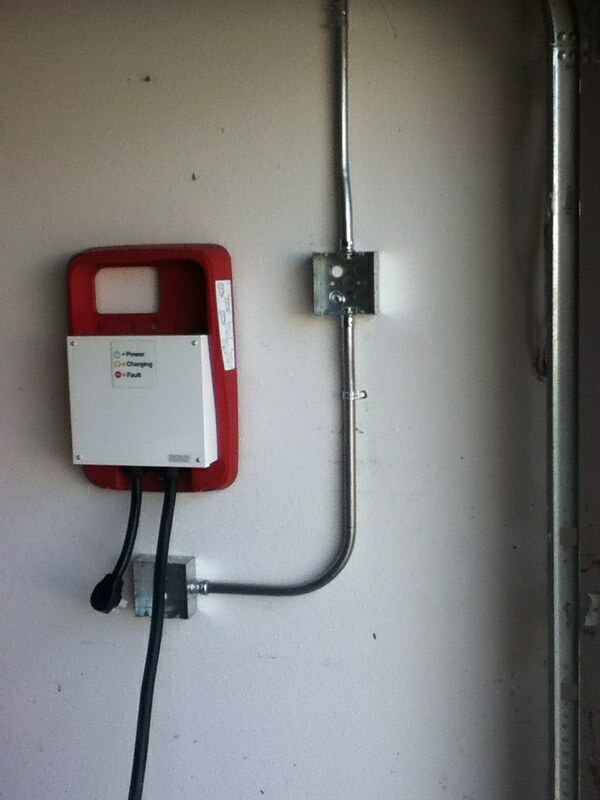 Here’s a picture of the Roadster charging on one of our exterior NEMA 14-50 outlets. 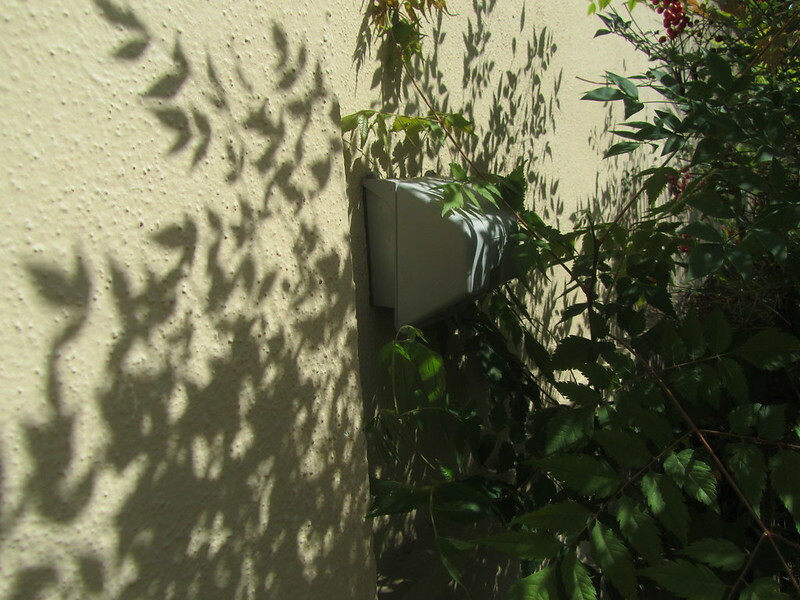 We had the same protective enclosure for the NEMA 14-50 that we installed on the exterior side of the house. Additionally, should we ever decide to get an RV, we can plug an RV on the side of the house as well since this plug is dedicated to its own 50 Amp circuit. 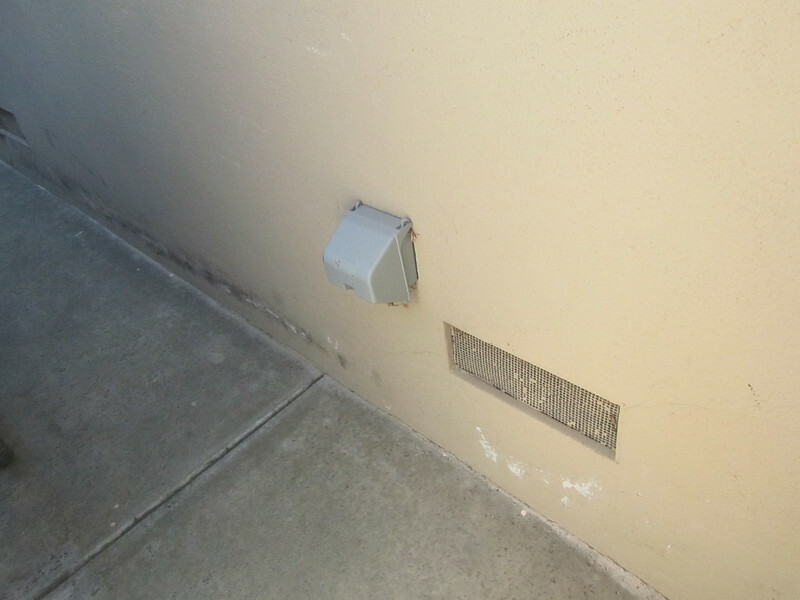 Here is that outlet without the Roadster plugged into it. That is the MC240 that the Roadster originally came with. It has a hardwired NEMA 14-50 plug on the end of it. It’s just on our driveway, but away from blocking the garage. 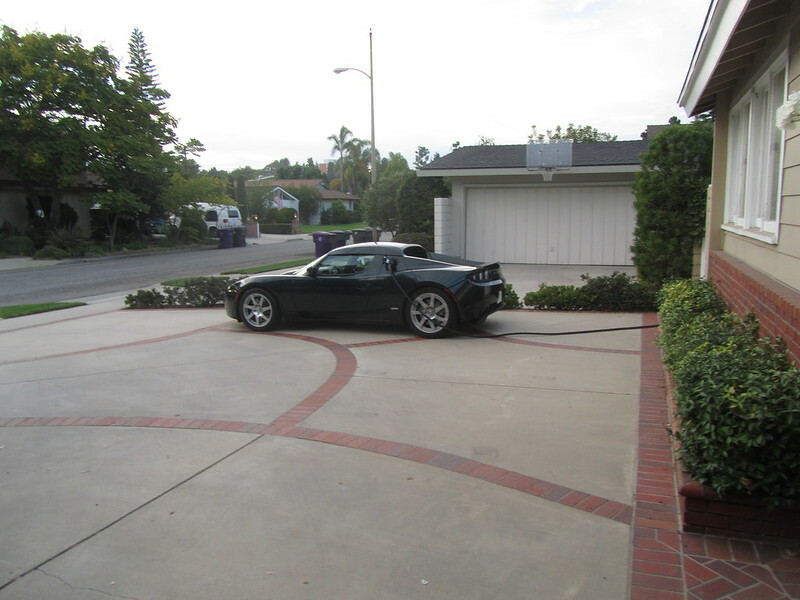 This was convenient, but not the ideal place for the Roadster, the noisiest that a Roadster gets is when it is CHARGING, so we make sure, in the interest of keeping the peace with our neighbor, to have an outlet ready for the Roadster in the garage. 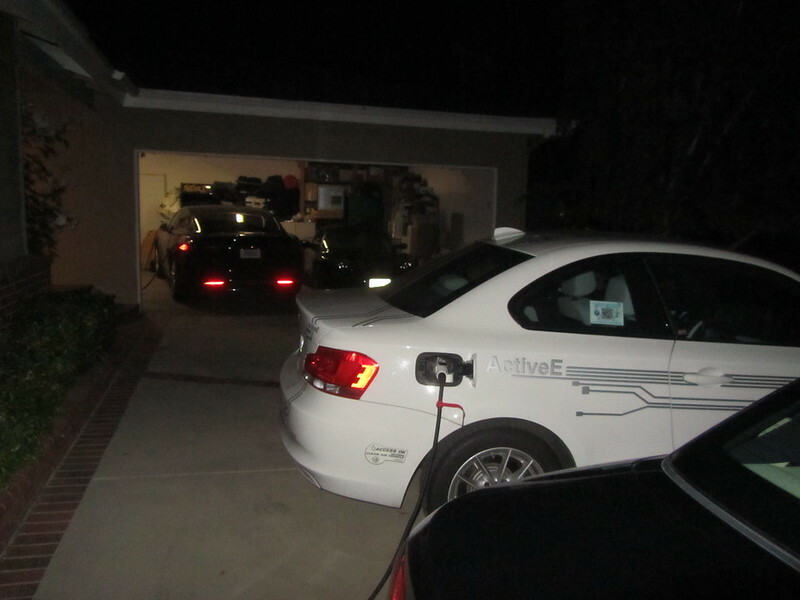 During the months between November 2013 and February 2014, we kicked the Active E out of the garage and it ended up charging on the driveway. 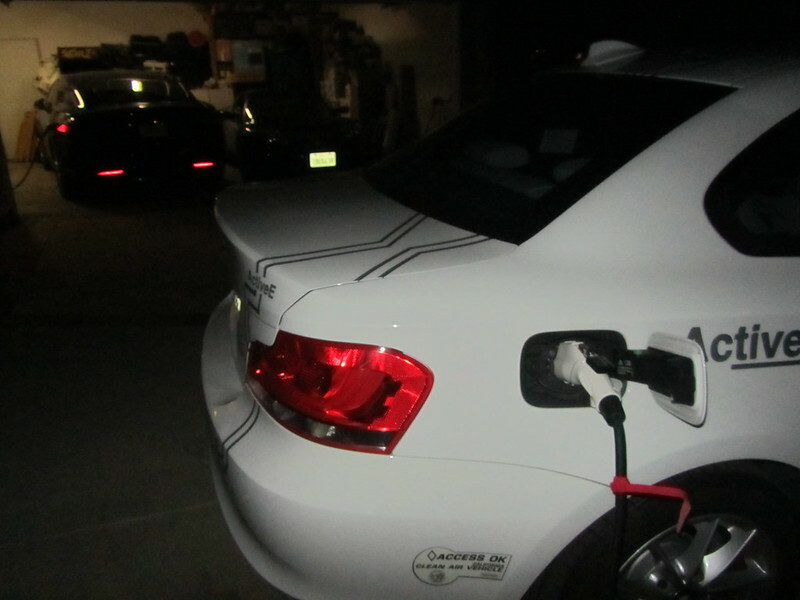 Here are a couple of pictures I took when we used to have all three cars, all plugged in and charging. The J1772 EVSE that is plugged into the Active E during this duty cycle is the Jesla that I had asked Tony Williams of Quick Charge Power make for me. It is great to see all the business that he has since built from the time that he made this product for me. That’s a long way to catch you up to what we just had done this past weekend… in 2016. Well, a short while ago, we’ve had some charger challenges with the Roadster. During testing, we kept swapping chargers to see the effects, and as a result of one of these tests, the MC240 that came with our car died and was not repairable. Our service center provided us a replacement as a result of this failure because we still had our CPO warranty in effect. 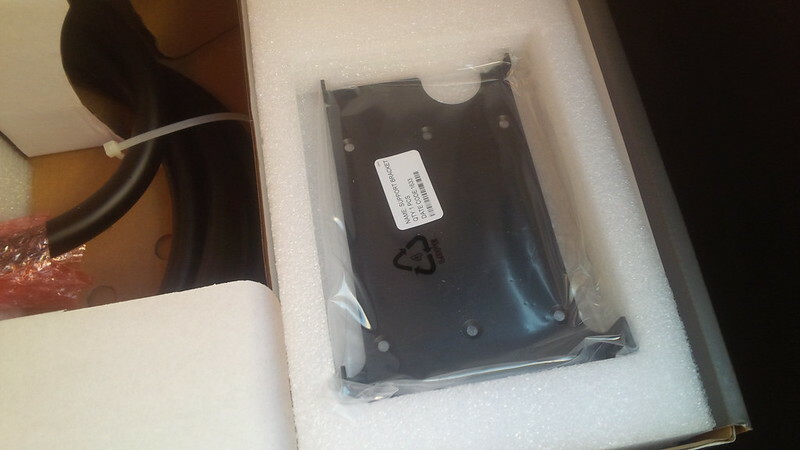 The MC240 is quite rare, so the service center provided us with a second Roadster UMCs. My point was that they were producing more of these HPWCs, the price for the unit has dropped significantly and is about a third the cost of another replacement Roadster UMC. 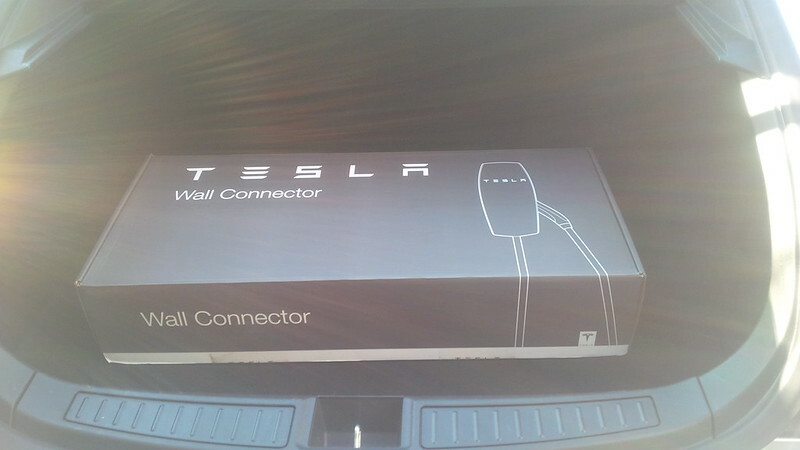 The retail price for the Roadster UMC is $1,500 without a NEMA 14-50 connector, and adding that connector is an additional $100 for a total of $1,600, and the Model S/Model X HPWC is now $550 for the 24 foot model. Luckily, my logic was deemed to be a sound one, and we were able to get a 24 foot Tesla Model S/Model X HPWC (ver 2? (the one that can be daisy-chained)). I figure that between the Roadster UMC, the Jesla, and our CAN SR and CAN JR, we have enough portable Level 2 capability for the vehicle. Several weeks later, mid-last week, we get word that the replacement Tesla Model S/Model X HPWC was at the service center ready for pick up. We went to pick up the box from the service center and take it home. It wasn’t going to fit in the Roadster, so we took an S (the service center’s loaner as the Roadster is in the shop for its annual service) to bring this box home. One thing about the Model S/X High Power Wall Connector is it is glorious and aesthetically pleasing EVSE. In order to install the unit, it had to be hardwired, and I’m not an electrician, remember. 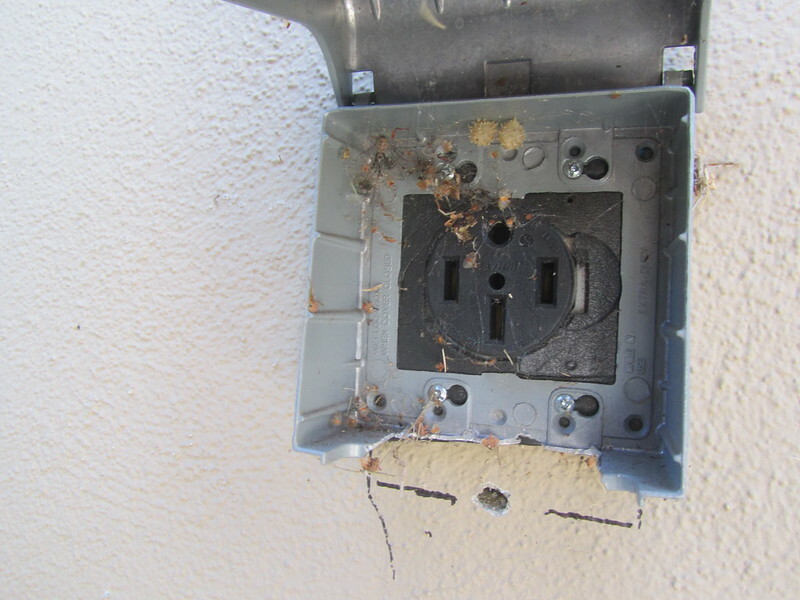 I scheduled our electrician to do the work this past Sunday, September 25. As I mentioned earlier, we ran 70A service to the garage for the Roadster and the two shared NEMA outlets (the NEMA 6-50 and NEMA 14-50). I figured to have him use that feed for the HPWC. Since it seems that we’re now predominantly a Tesla family, I also had one other change that I requested. 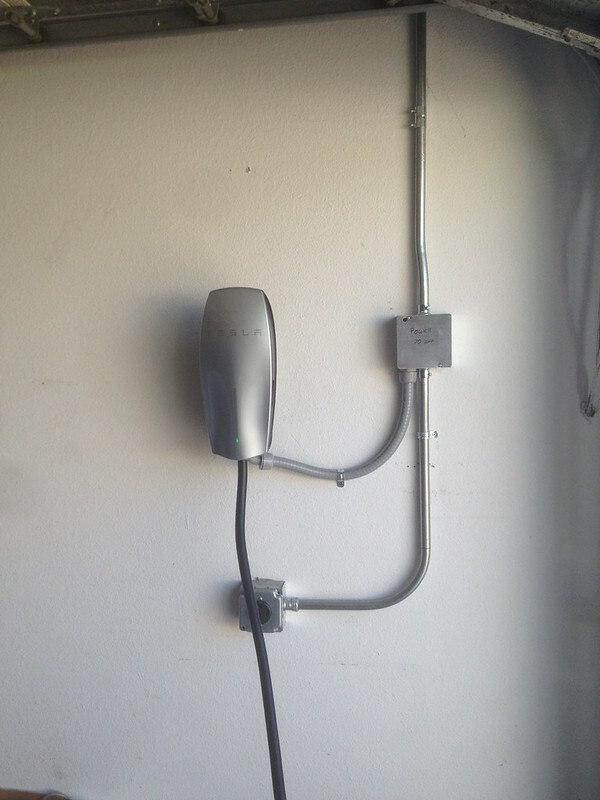 Between our Tesla bias and the fact that there are now more EVSE providers that are selling NEMA 14-50 plug-in EVSEs, not just NEMA 6-50 ones, I went ahead and asked our electrician to replace the NEMA 6-50 outlet for the Roadster with a NEMA 14-50 one. Besides, the nearest supercharger to us is Fountain Valley and though it is a supercharger, it is easily the busiest one in the area as is evidenced by this photo around 1pm on 9/27/2016. Additionally, we still have the NEMA outlets (now all 14-50s). We just have to manage the load effectively, and safely. I could use the advanced features of the new HPWC and daisy chain them in the future, but I think we’re OK with the way we’re set up for now. In the meantime, we just have to do the math and run a total of 56A on the feed. One requirement currently is that all these vehicles will have to be Teslas because it’s difficult to limit each feed to only 16A… We can, conceivably charge two Teslas at 20A and a Chevy Spark, Chevy Volt, or 2011/2012 Nissan Leaf on 16A of power. As we mentioned earlier, many EVs now run at 6.6kW or higher and that’s 32A of power on 240V. Furthermore, once we get our Model 3 reservations delivered, we’re ready for those as well. We might need a bigger driveway and garage!